What is Nitrogen Narcosis? What are the Symptoms and how to avoid "getting narced"
In his book ‘The Silent World’ Jacques Cousteau coined it ‘the rapture of the deep’. Some refer to it as the Martini Effect, comparing it to drinking one martini for every 10m/30ft you descend past 30m/100ft. Most commonly it is referred to as Nitrogen Narcosis, or in diver slang ‘Getting Narc’d.’ When Gas Narcosis was first discovered, it was assumed it was caused by Nitrogen, which makes up the highest percentage of gas mix in our tanks. The name has since stuck, but the most scientifically correct name would be Gas Narcosis, because any gas that we breathe at depth can cause narcosis. 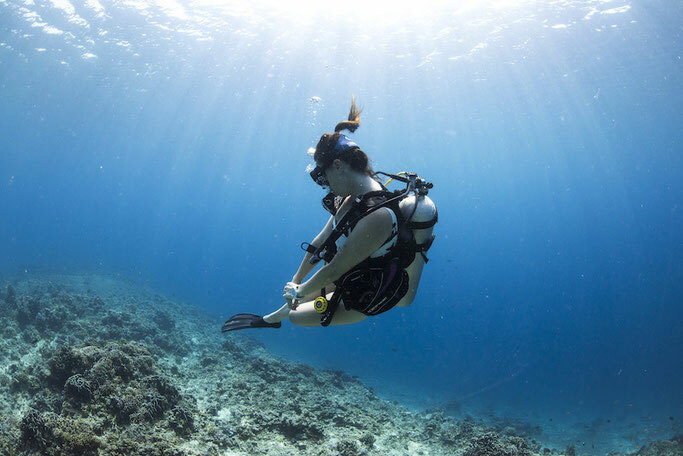 Whatever you call it, it’s a phenomenon that can affect any diver going below 30m/100ft, though some divers have experienced its effects at shallower depths. *Please note: If you are concerned that you are experiencing a dive-related injury or other health issue then seek medical advice. Divers Alert Network offers advice and information for divers. “On the surface we breathe air. Air contains different gases, like oxygen, nitrogen and carbon dioxide. Our bodies use oxygen, and expel carbon dioxide. There are other gases we can breathe, but don't need, like Nitrogen. Since these gases are not used in the body, we believe that they do not have an effect on us, so they are known as "inert gases". On the surface, inert gases like nitrogen come and go, but underwater they have more of an effect, due to the increased pressure. When we dive, the force of the water on us increases the pressure of the gases we breathe. This means that, as we dive deeper, all the gases we breathe are squished down into a smaller space and are more concentrated. More molecules of all the gases are going around our bodies. Our bodies carry gases to various organs and tissues that need oxygen. One part of our body that needs a lot of oxygen is the nervous system. That's the brain and spinal cord, as well as the nerves that let us sense the world and trigger our muscles to move. The nervous system simply works by sending messages around the body. As our bodies are very good at getting gases to the nervous system, this is the part of our body that is most affected. The severity of Gas Narcosis varies greatly from diver to diver, and even from dive to dive. Some divers may have a consistent narcosis experience, and some feel it one dive and not on another. Though many studies have been done, the exact reasons why Gas Narcosis occurs or why experiences vary so greatly is still a mystery. Theoretically, narcosis effects all divers going below 30m/100ft. While it may all sound a bit daunting, Gas Narcosis itself causes no permanent or long-term damage. Most often it impairs a divers judgement and causes them to make simple errors. The risk is that these errors can turn into more serious situations, such as forgetting to check your air supply, descending too deep, leaving your buddy etc. How can you avoid Narcosis? Unfortunately, there is no way to avoid Gas Narcosis. As a responsible diver, it is our duty to learn how to recognize, manage and cope with narcosis. In the Advanced Open Water Course during the Deep Dive training, you’ll learn about the symptoms, how to recognize them, and how to deal with them. Your instructor will give you training exercises to see how susceptible you are to getting narc’d. This is a safe opportunity to potentially experience nitrogen narcosis for the first time, and help you understand the possible consequences of deep diving and how it can affect you. Never dive deeper than you are trained for, and get a refresher if needed. 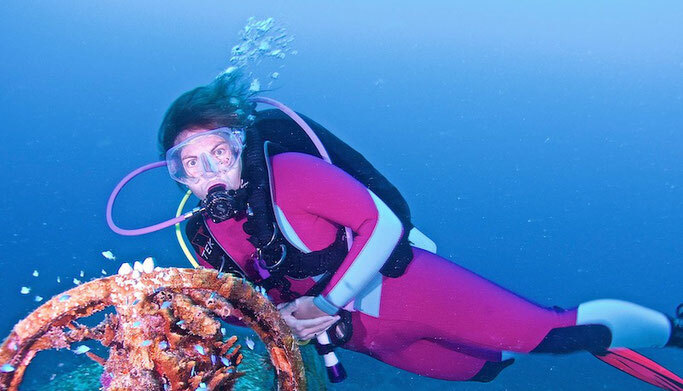 Read also: Decompression sickness in women; are we more at risk? While you should be rested and sober for at least 24 hours before any dive, this is even more important before a deep dive. Alcohol and drugs can intensify the narcosis effects. If you are taking prescription medication, always check with your doctor if they might affect your mental state. Plan your dive, and dive your plan! Descend slowly and allow the partial pressure to increase gradually. Keep things simple and don’t attempt a complicated dive at deep depths. Avoid overexertion before and during the dive. Increased levels of CO2 in the blood can affect if and how narcosis hits you. If diving in cooler waters, make sure you’re warm during the dive. Being cold has shown to increase the effects of narcosis. Never deep dive solo, and be open with your dive buddy. If you’ve experienced Inert Gas Narcosis prior, share this information with your buddy. Ask them if and how it has affected them. Watch out for each other, and know the signal. The hand signal for Gas Narcosis is the same as ‘you’re crazy.’ Move your finger in circles at the side of your head. You can also try a Narc Test while you are at depth. Make sure to discuss this at the surface with your buddy. There are a few, but a popular option is the finger test. During the dive, hold up a number of fingers to your buddy, let’s say two. Your buddy should respond with the same number plus one, so three. If they reply with any number other than three, you should ascend to a shallower depth. While you can’t build up a tolerance to Narcosis, with experience and training you will learn to recognize and cope with its effects. If you or your buddy are feeling the effects of Gas Narcosis, ascending as little as 10ft/3m should help immediately. Ascend (safely and slowly) as needed until the effects have cleared. Communicate with your buddy, and as long as you are both okay and it is safe to do so, continue your dive as planned, or adapt as needed. If you have any concerns at all or don't feel comfortable in anyway contact D.A.N and talk through your symptoms. Most importantly, never be afraid to abort a dive. If you don’t feel safe, or you or your buddy has made a dangerous mistake, end the dive. Have you experienced Gas Narcosis? Let us know about your experience in the comments below! Happy bubbles, and stay safe down there. Never dive without insurance! If you do need to seek medical advice at all then your insurance will cover all the costs! It's a small annual fee to pay for a clear conscience! 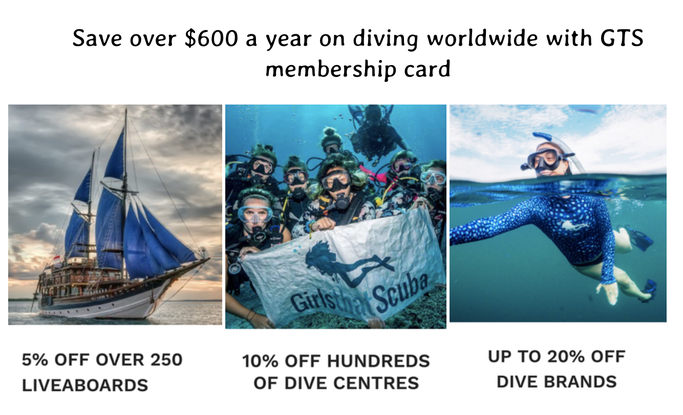 We love DiveAssure who offer not just dive insurance but travel insurance too, and if you are a part of our GTS membership card you'll get an extra 5% off all policies!